Action Tray | Appracatappra, LLC. Available exclusively as part of the Action Components suite. 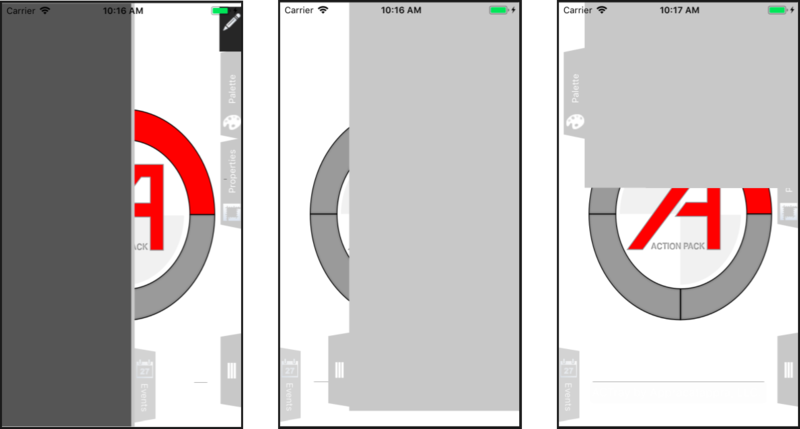 Draggable – The user can drag the tray out from the edged anywhere between its open and closed positions or double tap it to snap between open and closed. Popup – The tray will snap between its open and closed positions when its Drag Tab is touched. AutoClosingPopup – Just like the Popup tray but it will also close if the user taps its content area. You can place individual Action Trays along any edge of the screen or place several Action Trays together and attach them to an ActionTrayManager to control them as a group and use them like palettes or menus. The ActionTrayManager provides events to respond to user interaction in any of the trays it controls and it automatically ensures that only one tray in the group is open at a time. Plain – An empty Drag Tab. GripOnly – A 3 line grip in the Drag Tab. GripAndText – A 3 line grip and a title in the Drag Tab. TitleOnly – Only the title in the Drag Tab. IconOnly – Only an icon in the Drag Tab. IconAndTitle – An icon and title in the Drag Tab. CustomDrawn – Allows for a totally custom drawn Drag Tab. TopOrLeft – Appears on the top or left side of the Action Tray based on its orientation. Middle – Appears in the middle of the Action Tray. BottomOrRight – Appears on the bottom or right side of the Action Tray based on its orientation. Custom – You can control the position of the Drag Tab by setting the tabOffset property of the Action Tray. Action Tray includes a fully documented API with comments for every feature. The Action Tray user interface is drawn with vectors and is fully resolution independent. // it to be a drag out tray. // Are we on an iPhone? // to be a popup tray. Touch it's dragTab to open and close it. //Are we on an iPhone? NOTE: Action Trays and the UIViews that they control can be completely created in C# code without using .storyboard or .xib files.